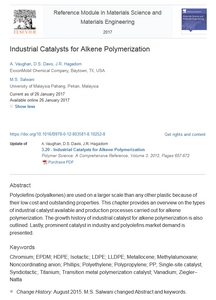 Polyolefins (polyalkenes) are used on a larger scale than any other plastic because of their low cost and outstanding properties. This chapter provides an overview on the types of industrial catalyst available and production processes carried out for alkene polymerization. The growth history of industrial catalyst for alkene polymerization is also outlined. Lastly, prominent catalyst in industry and polyolefins market demand is presented.